Insurance appraisals should consider the type of insurance policy when determining value. Estate appraisals should consider "Wholesale Markets" while Sale appraisals should consider market values and trends. Valuation of period regional furniture requires a comprehensive inspection and documentation of features like architectural details, primary and secondary wood identification, specifics of construction and maker signatures. Documented provenance or history of ownership is very significant to furniture valuation. The appraiser investigates current market sales of equivalent furniture and an analysis is performed to form an estimated fair market value. Queen Anne Mahogany Low Boy, Massachusetts, circa 1770 with a rectangular thumb molded edge top mounted on a dovetailed case of three mahogany boards and rear board of butternut. 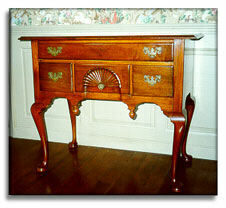 The four drawers have double beaded edges with white pine sides. A deeply carved shell and blocked apron suggest the Massachusetts origin. Removable cabriole legs have enlarged pad feet associated with the Late Queen Anne period. Identify and inventory those items you wish to appraise. Send or fax a copy of the inventory so we can prepare a cost estimate. Set a date with us to inspect your inventoried items. As an example, for the period furniture, our valuations include wood identification, construction techniques and finishing. When appropriate, investigations can be carried out and results included as a part of the complete appraisal report. We submit our appraisal cost before we start. We must see the property to appraise it. © 2019 by John A. Woods Appraisers. All Rights Reserved.